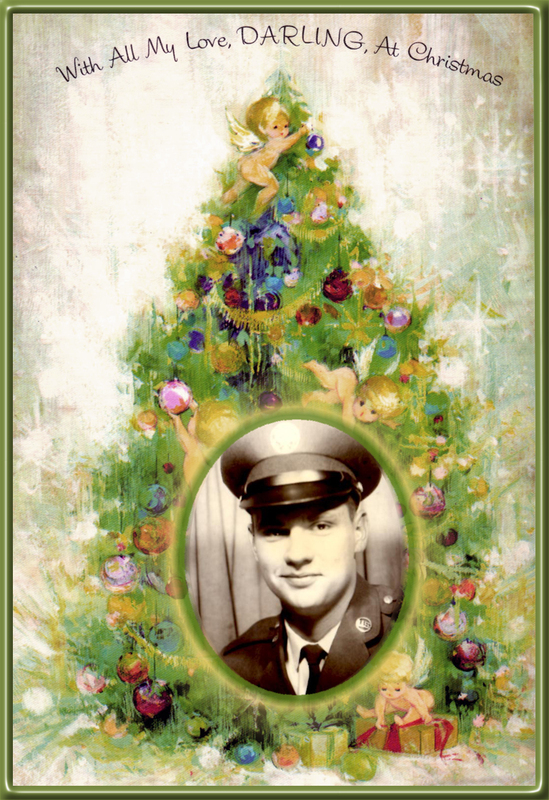 My Dad when he was in the Air Force, set within a scan of a Christmas card he had sent my Mom in the 60’s. Dreams and Dad. I have been grieving my Dad passing in October, at least when I can fit it into my days. Its not been much, and I think it is catching up to me. Christmas is getting closer, and of course it makes me miss my parents even more. Holiday songs and decorations are everywhere, and they set in the nostalgia and waves of both smiles and sadness as I remember times I can never have again. I miss them both so much, I start to choke on the lump in my throat. When I was at my father’s for the very last time, I saw he had beautiful Christmas card covers all over the front panels of his kitchen cabinets. Now, I can never look at another Christmas scene again, without my thoughts flooding to him. I dreamt of him last night. As dreams often do, it was weird, and thought provoking. Mind you, as time has gone by, as typical, I have forgotten a lot of details. It its good to keep a dream journal, which I intend to do, so that you can write down the details as soon as you wake, and then revisit them later to contemplate. It is good to do this, as it opens up parts of our subconscious to explore and resolve. But, what I can remember has me thinking a lot. In my dream, my father had died, but then we found out, that they were able to revive him and he was still alive, even though we knew it would not last long. It is my belief that people who die, often come back somehow in our dreams. It is also my belief that this is our subconscious way of resolving things with them, that perhaps we had not been yet able to. We bring them back in our dream somehow which seems more feasible, and then go from there. This happened to me back when my mother died too. The way our dreams bring them back, often reflects how we feel about the death, or them at the time. For me, I was angry that my mother was taken. I was hurt that she suffered for so long, only to go in such a horrible way. (Again I might tell about that experience at another time.) With my dad, yes I have run the gamut of the grief stages like anyone else, but mostly I am sad that he had to go, hurt that he did not take better care of himself, hurt that he did not wait for me to get there and say goodbye, and hurt that he never really did tell me that he ever approved of me, was proud of me, or ever really spent much time with me. So, back to my dream, he had died, but been revived. We knew that he did not have much longer. I recall mostly varied images and confusing things going on, but next I recall seeing him dressed in a more dressy, more old-fashioned, yet somewhat western-feel outfit. I think we were all at some sort of gathering or dinner etc. During my time going through stuff where it has been stored, I came across many things in my Mom’s stuff, that she saved from my Dad, even though they had been divorced for something like 25 years before she had passed. I even found a card he had mailed to my mother before I was born, when my brother was just a toddler. It was written to mostly my brother, but also to her. I knew that this card would mean a lot to my brother. So I saved it, so that I can soon mail it out to him. In my dream, I knew at this event, I wanted to give it to him. So I first showed it to my Dad, and then was getting ready to give to my brother. I was waiting for J to arrive so he could see. My Dad really beamed when he saw it. Fast forward as I do not remember what happened in between, I saw my Dad laying down on something. He looked at me and smiled. At this point in the dream, I realized he had been dead and then came back, and he had this knowing about him, like he had seen things while there. Through his smiles, and fading eyes, he looked at me and said, “I know everything about you, I even know that you have 34 muscles in your face.” And then he passed away with the smiles on his face. That is all I remember. I wonder now what this means. You see, in trying to come to terms with his death, I made a wish a couple weeks ago. I am not sure if I could call it a prayer or a wish, but I made it nevertheless. I wished that since he never told me he was proud of me, or made me feel like he was somehow, I wished that he would find a way to let me know he was, that he approved of me and my life, despite my ups and downs. I so badly need to know. I know he loved me, but you know how sometimes people can love you, but not like you? I have always wondered. I asked for a sign that he did, and asked if maybe, like my mother did, he could come to me in a dream and tell me. Of course, like most of my family, my Dad was always stubborn. I wonder if this dream was his way of letting me know, since it wasn’t done how I asked for. =P He did tell me he knew everything about me. Perhaps his way of letting me know he cared. Or perhaps my own way, of the more self-assured, wiser part of my subconscious letting me know, that he did care more than he showed. It is hard to say at this point, because I honestly don’t know what to believe. I only know three things right now. I know he loved me. I know I love him. And I know I miss him like crazy. What the rest means, I am not totally sure. But the dream did make me feel, oddly enough, somehow reassured and comforted. Maybe he does watch over me, maybe he does know where I am at and what I am doing. Maybe both my parents do. Do any of you wonder about dreams like I do, and what they mean? I wonder if its a heavenly connection, if there is a heaven or afterlife, if they can see us, if they do follow our lives, and what it all means. I wonder if dreams are ever about connection with them. I wonder if dreams can ever be premonitions of the future, or keys to the past. I wonder if they are only collections of our subconscious and clues to our inner self. It is so cloudy and confusing at times to think about. I would love to hear what you think, or about dreams you have had. I leave you with the above image, a conglomeration, if you will, of two precious things to me. One, of course, is an image of my father, when he was in the Air Force in the late 60’s. It was an image he took just for my mom, and sent it and several others on a sheet of paper. Under each image was a caption written to her, with things like, “Hello beautiful!” and things like that. I found this paper among my Mom’s things over the last few months. It will now be one of the most precious things I will ever own. He used to write her tons of love letters and cards and such while in the service, all before I came along. So far, the letters have been lost, but I found at least a dozen cards to her, and this precious page of pictures and captions. I cannot begin to tell you what they mean to my heart. I feel complete gratitude for being born from so much love. And decades later, after divorce and disease had hit my mother, she still saved them deep in her drawers. Even my father told me many years later, how much he still and always will love my Mom. That, how they felt and the connection they had, mean everything to me. The other image above, is one from the front of a card he sent her in the late 60’s. I scanned both of these in and made this image above. I hope it does both of these people I am lucky enough to call Mom and Dad, justice. Thank you for sharing this four D day/week with me. I feel it getting better already. I honestly think even just writing about it here, is cathartic somehow. I would love to hear your experiences, or perhaps even ones that you can relate to with my own. I would love to hear how any special dreams impacted you. I am hopeful to add one of my gratitude posts tonight, as well as get working on that diy. I have to upload some images from my camera for it, and edit them and create the steps and post instructions etc. I also hope to start introducing you to a new section I am adding soon, having to do with getting back on my feet, getting back to work, and how you can help me figure out which direction I am taking to get there. 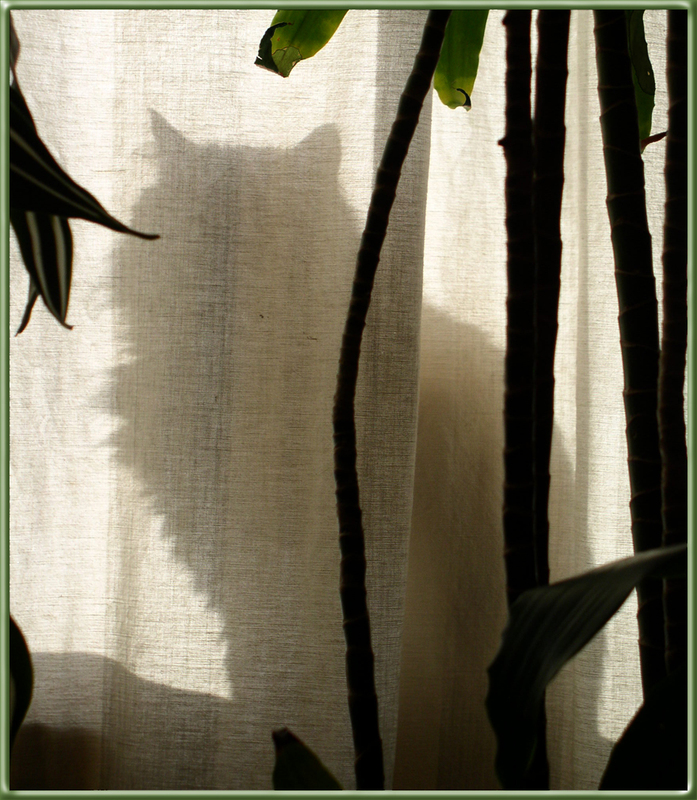 This is a silhouette of Honey in the window, my other lovely kitty. This is the first thing I saw today as I sat down to the computer to write this post. So pretty and yet so thoughtful. It is the four D day, and well, it all started last week after I got home from my monumental project. It has been a week of discouragement and delays. The other two D’s I will get into next post. Delays….we got the Uhual truck returned two days late. That costs money we don’t really have to spare. It took us longer than we thought to get ourselves rested, find a storage unit to offload the stuff to, and get ourselves together. Now I knew I/we would be tired when we got home, but wow, this hit me hard. I think I was just going on some sort of mental fumes the last couple months, especially since my Dad passed. I got back here last week after that long drive, and everything crashed. The emotional, physical, spiritual, and mental all just completely crashed in me. Each day that passed, I would sleep and could not get up. When I did get up, I felt sluggish and dragged my feet. So, I figured that my, well, everything, just needed it and slept a lot. That is why I did not post honestly. We were going crazy trying to get through getting a unit, get the truck unloaded, get basic things done like dinner, taking care of kitties, etc….and we just needed lots and lots of sleep. I am hoping that stage has passed, but I am trying to be proactive to get myself going again. A wonderful friend always reminds me, if you keep shuffling your feet, they can’t bury you. And of course, sometimes you just have to fake it, until you make it. Sometimes (well usually, just sometimes longer than others) that really works. If you just keep faking it, and acting as if you will succeed, and going through motions to get to that place you want to be, and pretending that things are good, as long as you don’t ignore what important things need taking care of, within and without, very often it does actually get better. Positive energy does have a way of taking over as you use it. It is sort of like using muscles. The more you use them, the stronger they get. So, for right now, I do admit I feel lousy, and discouraged, but I am going to keep shuffling my feet, and faking it, until I get there. I know I have lost a few readers during my down time, but I hope that if there is anyone left, you will share this journey with me. I am finding that aspect more important than I thought it would be. I thought I was just doing this for myself, and yes I am to a large degree. But, I find a longing to share. I want to fall down and get up again with others. I don’t think anyone should have to endure trials alone. I want to share them with others. I want to learn with others. I want to become a better person, and I would like your input in getting there, but more importantly, I am finding more and more, that I want to give something to others. I am entering a stage where these strong urges to do for others is beginning to awaken. Mind you, they were always there, but when you enter very dark stages of your life, you tend to crawl within yourself. You pull the covers over your head, lick your own wounds, and go through these dark tunnels in your life. It is my belief we all need these times, and it is okay to just take care of you. It is when you can put the mask on yourself first, that you can then help others. Well, I am coming toward a light at the end of these tunnels, I can feel it. And with that, I feel the need to help others. So, on that note, I am going to strive to look for the silver linings, the positive in all that happens to me, for both our benefits…the readers, and myself. I want to inspire others, to lift up and encourage, and I want to be a shoulder to lean on too. The other day, J’s mom was going to her vendor event (this tireless seventy-something woman is more active than me) to sell one of the two party-related items she sells. I was tired and worn out and wanted to grab some food, a cup of tea, and snuggle under the covers for the night. But when I heard she was going, I had left my TV dinner in the microwave, grabbed my coat and a cup of coffee instead, and ran out the door with her to help. When we got to her event space, I helped her set up her table and such. I know it helped her a lot, and it really did lift me just to help someone else. I am learning, albeit slowly, never resist urges to help others. It is almost always win-win, even when you can’t see it. The other night when we unloaded the truck into our 10 x 15 space, it took us from somewhere around 5 in the evening (we then spent the better part of an hour or two viewing the spots, facility, signing up for it, and chatting with the manager,) until about 1 in the morning. We were already tired, having not fully recovered from our trip. We spent roughly 6-7 hours on the road only two days before, on something like 6 hours sleep in two days. But let me back up for a moment. On Saturday night, we had only slept about 5 hours, as we had worked very late the night before wrapping things up. Then Sunday, we worked until about 5 or 6 in the morning getting the truck loaded and packing up the living space I had stayed in for the last three and a half months. Honestly, it was no different from any other move I have done, other than in duration. It just took way more than either of us thought. When the truck (17 foot) was loaded, and we had packed up everything we could find that needed to go, and then packed up Milo into his cage, we were ready to go. We loaded the cage into the front seat of the cab with me, and he drove the car, and I drove the truck. Boy this was eerily familiar. Last time I did this, was three and a half years ago, except then it was 40 feet of train (my 26 ft. moving truck fully loaded up to the door, plus 15 ft car trailer with my car on it), and my senior kitty George in the front with me, and driving 3000 miles by myself. This time, it was a smaller truck, no trailer, a much younger, healthier kitty, and only 250 miles or so to drive. But it was no picnic this time either, that’s for sure. We had stopped only one time, at a rest stop, to nap for about 1 and a half to 2 hours, me in the truck, J in his car. He had to work Monday, so this was grueling for him. We drove the rest of the way, and split off when he took a different road to work. He drove in to work his eight hour shift on only something like 6-7 hours sleep in over two days, and after lots of hard physical work. My poor sweetheart. I finally got home, unloaded my kitty and the cab of the truck (had to save the rest of the contents until we had a unit) and so badly wanted to go to sleep. But I thought of my wonderful J working so hard on no sleep, and the sacrifices he made. So, I knew I had to make a few sacrifices too, for us both. I watched my kitties get reacquainted for a bit, and settled in. I then walked down the street to the supermarket to pick up a few things for dinner, feeling like I was going to fall over. I walked home with my bags of groceries, prepared dinner, and we ate when he got home, and then we both just about passed out. Tuesday came, and some of the events of the day are literally a blur to me. We were that tired. I think aside from him working that day, we both just slept most of the time. Then on Wednesday, after work, we went out, found the unit, and worked until 1 in the morning or so to unload, dropped off the truck to the rental place, came home, had a quick bite to eat, and then he left for work again at around 5:30am. I think he slept about 2-3 hours that night. Ever since then, aside from running out to help his mother Friday night, and him working his day shift, we have just slept and slept. I am so glad he had Saturday and Sunday to sleep in and recover. I have so much to do here, but I just could not get myself moving. But, I am trying to not be too hard on myself, and realize, I just needed it. Come Monday, I thought I would be feeling better, but I realized, discouragement had set in. I looked around the house at all the stuff he has brought back here over the last few months, and the mess it was in. I thought about the storage unit I had up here, and the one still down there that were both filled with stuff to go through. I thought about the fact that because of the mess the house is in, and that it was not ready for company, that it would be yet another Christmas I could not do at home, and it made me so very sad. It has been quite a few years since I did anything for Christmas at home. Between all I had lost, moving across country, giving up for a couple years (I had just shut down and basically quit living, except for breathing and eating), and now the disarray that is relocating once again, it just is not feasible. Plus, my Dad passing away in October is really starting to hit me, and all the obstacles I have yet to get through. So, with all the delays, the discouragement setting in, I am at the point where I look around and say, “now what?” Well, leave it to me, I sit down at the computer, and of course go to Pinterest (I am such an addict of that site) and plug in…guess what? Yup, the word discouragement! I truly do like to see other people’s perspective on things, so I can keep a realistic and balanced focus. The news and other social media can be too depressing or immersed with bad news stories, and for some reason, Pinterest seems to be largely laden with eye candy, people’s impressions of aesthetics, and lots of hopes and dreams. It’s the hopes and dreams part that appeals to me. The returns I got were mostly inspirational quotes. And inspiration is definitely what I need. Three in particular caught my eye, and that is what I am going to focus on, especially this week. The first is, “Many of the great achievements of the world were accomplished by tired and discouraged people who kept on working.” That is for sure where I am at. I am very tired, and very discouraged, and like I said above, I am just going to move forward and fake it for now. The second is, “Don’t get discouraged, things will work out,” which not only is good advice, but leads back to the dream I had of my mother after she died (a long story for another day,) where she came to me and told me everything was going to be okay. Whether this was just a dream, or really her, I know it is how she felt, and what she would want me to take strength from. So, I remember that and take heart from it, when I need it most. So, stumbling onto that quote so quickly, tells me, that it as much as ever, applies now. And third, was a quote from a woman I admire and have loved as long as I can remember, Lucille Ball. “One of the things I learned the hard way was that it doesn’t pay to get discouraged. Keeping busy and making optimism a way of life can restore your faith in yourself.” I truly admire women of strength, and while I think it actually does help to allow yourself to feel how you feel, even if it is discouraged, I do however think that I/we can’t allow ourselves to live in any negative emotions for too long, or it does become a way of life. It is a painful and hard choice, but rewarding one, if we make the conscious choice to live in positives places, but to give yourself a break, when you take temporary detours down the negative ones. I do wholeheartedly agree that keeping busy and trying to make optimism a way of life is good for one’s self. That is my primary goal right now, to make optimism a way of life. I believe in my heart of hearts, all the rest will follow. I was starting to take a turn for the better last night, and feel some energy to get up, go out with J, and go get the battery replaced in my Ipod, and then stop by the mall to take some Christmas scenery shots with my camera. It is one of my goals to pursue all the things I love doing, until one of them pans out into something I can do with success, and hopefully to generate some income. So we first went to his brother’s place of work, so the two of them could work on replacing the battery. Mine is an Ipod 4th generation touch. After what happened last night, I am not sure I will ever buy an “I” product again, no less an apple product. Here is where discouragement came to visit me again. Both J and his brother are skilled in mechanical things. His brother works with software and hardware for a company for 15 years now, and even puts together circuit boards. J works with multiple massive machines at his company, using both the machines and the computers that drive them. That does not even account for his impressive skills with all things machine and problem-solving abilities. The two of them together, worked on replacing the battery in my Ipod. After watching a bunch of how to videos, and bringing up a few step-by-step sites with detailed instructions, they started by using a low temp heat gun to loosen the adhesive on the unit, to pry it open. It took a long amount of time, a good hour or so, and lots of contortions, but they finally got it open. Another hour or so later, and they finally got the new battery in. They followed everything the videos and sites recommended. But, I was heartbroken to come to find, the touch screen was damaged, and would not work. So much is on that thing. I took many photos, some videos, and lots of notes and things. It is like a mini-computer, and when you lose a computer, well, you can imagine how upset I was. Nevertheless, I was gracious to his brother for trying, and we went home. But, so much has happened, I have had so many stumbling blocks, and I am so tired, that it was just a small straw dropped on a huge pile of difficulties, and I broke down crying last night. We never did get to the mall, and I pretty much cried myself to sleep. I cannot believe that company would make any product so hard to get into and replace a simple battery. If I can help it, I will never buy another product of theirs again. When J’s brother showed me his Galaxy, and how easy it was to pop open the back and throw in another battery, I knew that it was the way it should be, and will likely look into buying an alternative the next time. So, today is a new day. I slept in very late, about 1 or so, but finally got up, and set out to accomplish anything. I am going on one cup of coffee now, need to feed my kitties and get myself my first meal of the day, and a second cup of coffee, but at least I am started on a new post, a new day, and trying to attain a new outlook. I AM going to do this, I am going to keep shuffling my feet and move forward. I had a dream about my Dad. It was pretty profound. I will go into it in my next post, after food and another cup of coffee. I am working with a lot of discouragement right now, but I am going to keep working my way out of it. It has been a long week of delays and discouragement, but I hope any of you have hung in there with me. This metamorphosis is going to be long and painful, but it is my hope you will share it with me, the ups and the downs, and in the end, I hope we can all come out of it with something good. Have you suffered discouragements lately? Is there anything you were able to do to help you recover from them? What do you strive to do most when you feel this way? I really would love for you to share. I would like to be inspired by you, and likewise inspire you as well. Let me know in the comments below. Hope your day/week/month is going well, and you have encouragements to keep you going, when it gets rough.